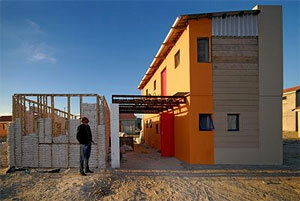 In 2008, Design Indaba invited architects to design ten low cost houses on ten sites in partnership with ten international architects, for ten families. He reminded us of the fundamental problem facing us: that our cities must accommodate more people than they were designed for. And by “accommodate”, Luyanda means more than people simply fitting in or surviving. Children need spaces to play in . People need gardens and privacy. In designing this house, Luyanda Mpahlwa was striving to create more than a unit for living in. 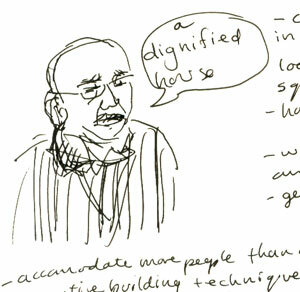 He was creating a dignified house. To achieve this, Luyanda’s team used an old method of building that has been in use all over the world – that of using sand bags in a timber frame. 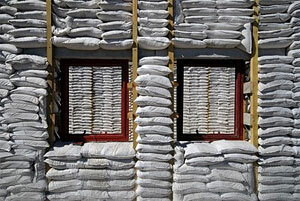 Sand is packed into plastic bags, which are in turn stacked inside a timber frame. The frame is covered with wire mesh, and then plastered over. This technique has a number of advantages. It does not require skilled labour, and unemployed women from the surrounding community could help build the house. Sand is plentiful and easy to gather. The resulting structure is solid and well insulated against heat and cold. Luyanda and his team succeeded not only in designing and building this house, but in having all their techniques officially approved by the relevant authorities. The house was slightly over budget, having cost R74 230 to build. Here is an image of the first completed house. What I appreciated was the architect’s consideration for the needs of the house’s occupants. A double story house like this meant that there was space for a private area for the children to play in, for a garden. Luyanda Mpahlwa won the Curry Stone Design Prize for this project. This is an initiative of the University of Kentucky College of Design, to recognise design that improves the lives of people and the state of the world. In an ironic twist, Luyanda could not attend the prize giving ceremony as he was refused a visa to enter America. Why? Because he had spent 5 years in Robben Island under our previous regime. Like many other speakers at the Indaba, Luyanda Mpahlwa reminded us of the potential and power of working collaboratively.